I like football. I haven’t watched a lot of it for the past two years because I am disgusted with the fact that the game has become political. I watch it for the sport–not for the politics. However, I did watch the Super Bowl last night and thoroughly enjoyed the game. It was a well-played game with incredible defense from both teams. 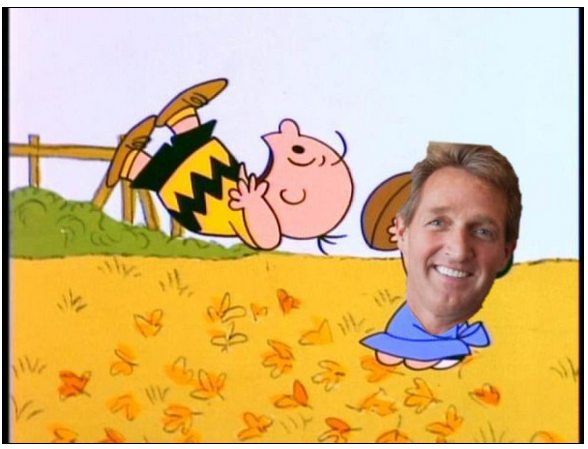 However, there was one really endearing moment for those of us who sit on the political right. 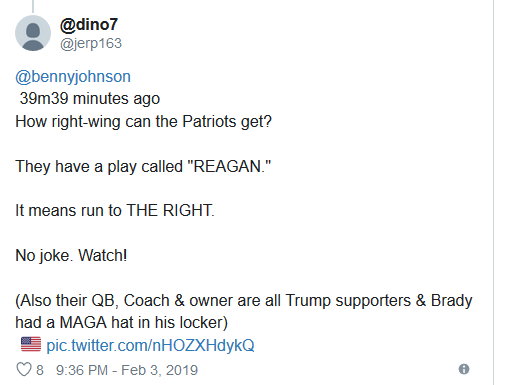 Did Tom Brady just shout Reagan? 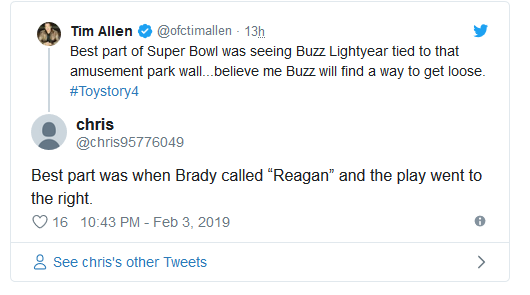 A microphone caught the New England Patriots quarterback saying “Reagan” during the third quarter of Super Bowl LIII, played at Mercedes-Benz Stadium in Atlanta. Brady is known to be friendly with President Donald Trump, so was it an ode to another Republican Commander in Chief? I love creativity and humor! Other activities include a card writing station to show military appreciation, giveaways, food and much more. Chick-fil-A will also be flying in Army and Navy veterans nominated by local franchise Operators located across the country to attend the pre-game ceremonies and the game. Chick-fil-A founder Truett Cathy was a World War II veteran himself, and the company is proud to count many veterans among the more than 120,000 Operators, Team Members, and staff who represent the brand nationwide. The company plans to continue its commitment to hiring and honoring veterans, recognizing the value in their unique skills and easing the transition to civilian life after service. Recently, Chick-fil-A was named No. 2 on Indeed’s list of Top-Rated Workplaces as ranked by military veterans. There are many reasons I love Chick-Fil-A.